So after talking about how big beverage corporations have been targeting their marketing campaigns towards young people, and discussing how the Bloomberg administration has been using an advertising campaign to combat overconsumption of these sugary beverages, I think it’s worth examining a more recent battle of food campaigns. The issue/mini case study at hand: calorie counts. At some point recently when you were out ordering food, you might have noticed that there were calorie counts on the menu. This was not an idea developed by restaurants themselves (shocker!) but rather was a regulation passed in 2008 by the Bloomberg administration requiring chain restaurants with at least 15 different stores to post the calories of their products. One in six customers (15%) reported using the calorie information to make their purchase, and these customers purchased an average of 106 fewer calories. (via NYC.gov). “Stuff your face with value.” That is the unintended message that posted calorie counts convey to the average consumer. Having calories posted along with prices makes it absurdly easy to see which menu options provide plenty of calories per dollar and which do not. So if you are hungry and one $5 sandwich has 580 calories and the other one only 230, what is your choice? A meatball marinara footlong with cheese is my rational economic decision — and hold the lettuce. The numbers that pop out immediately are the number of sandwiches (2), the price, ($3), and the calories (900). 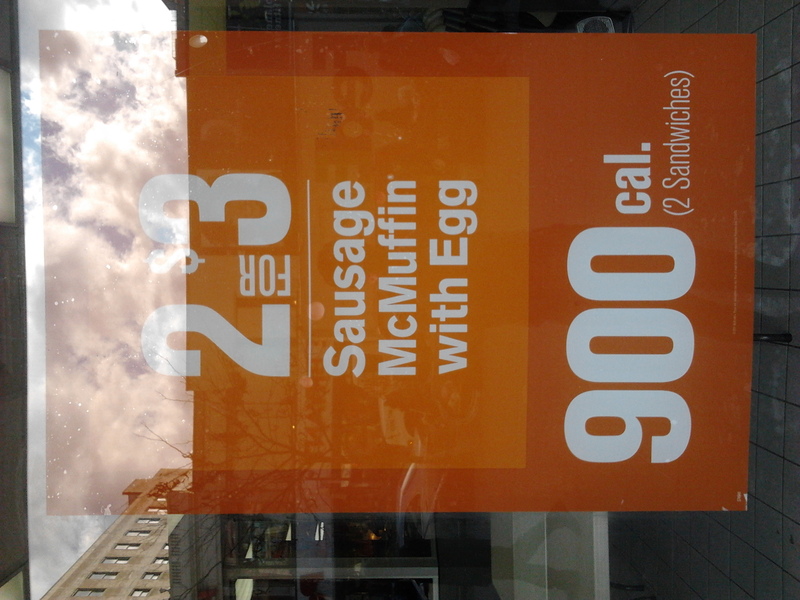 One might initially think that McDonald’s would try to hide the high number of calories in their products, but in fact, it seems as if they’re using the calories to promote them. For those without a lot of money who are looking for a big meal, it is hard to beat 900 calories for $3. Could the requirement to post calorie counts actually be making certain populations less healthy? This, if you ask me, is the dark side of a food campaign. Any ideas on ways to tweak this policy in such a way that it promotes healthy eating choices across all levels of income? Share your thoughts in the comments! Thanks David for blogging about this issue and giving a voice to people who deserve healthy eating choices. Are there any food campaigns to promote green markets in low income neighborhoods in the city? Maybe you can blog about this? Also I remember in the Fast Food Nation film, they talked about how in some schools they were advertising for fast food and soda companies. Are there any laws that have challenged this? Yes, the poverty stricken are a nuisance with their enforced thrift, their inability to contribute to the commerce of overpriced conspicuous consumption. The McD advertising makes a ton of sense for the restaurant chain and for a market segment they alone cater to. If you think advertising is foolproof in its function, try advertising your snobby knobby heirloom tomatoes at $5.00 each or your basic organic pork chops at $25.00 a pound and see how frantic customers break down your doors to get at those bargains. I swear some people live secluded in a protected little Oprah bubble. OH, well, prattle on, girls!